6% in Ohio: 48 vs. 42 pts. ; 4% in Florida: 47 vs. 43 pts. 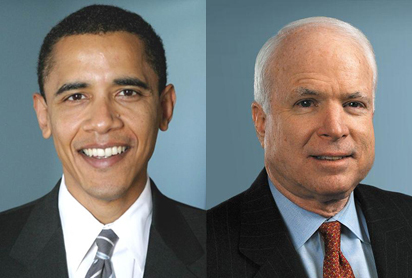 WASHINGTON (CNN) – Sen. Barack Obama is leading Sen. John McCain in the crucial swing states of Ohio, Pennsylvania and Florida, according to a new survey of the so-called battleground or purple states. Obama lost the Democratic primary in Pennsylvania by 9 percentage points. But a Quinnipiac University poll released Wednesday shows him leading McCain by 12 points, 52 to 40 percent. In Ohio, a state Obama lost to Sen. Hillary Clinton by 10 points in March, he’s leading McCain 48 to 42 percent. And in Florida, where he did not campaign this primary season and lost an unsanctioned Democratic contest, he leads McCain 47 to 43 percent. The Ohio and Florida results are reversals from Quinnipiac polls published a month ago, when Clinton was still in the race and McCain led Obama in hypothetical match-ups. In the waning days of her campaign, Clinton argued to voters and superdelegates that she should be the nominee because she was the stronger candidate to beat McCain in these swing states during the general election. Democrats in all three swing states say they’d like to see her on the ballot this fall, but independent voters give the idea a thumbs-down by margins of 9 to 16 percent. Florida clinched the presidency for George W. Bush in 2000, and Ohio did the same in 2004. Quinnipiac surveyed between 1,300 and 1,500 voters in each state June 9-16. The polls had margins of error of plus or minus 2.5 percentage points for Pennsylvania and 2.6 percentage points for Ohio and Florida. If the swing state momentum for Obama catches on all over the country, there may be a new electoral map. The latest CNN national poll, conducted by the Opinion Research Corporation, shows Obama running strongest in the West – and not just California. “The 10 Rocky Mountain states have been traditionally the most Republican part of the country. So that’s why it’s so amazing that the polls show Obama doing well out here,” said Bob Loevy, a political science professor at Colorado College. Nevada, New Mexico and Colorado, three Western states that Bush carried by narrow margins in 2004, now look vulnerable to a Democratic takeover, even though they all border McCain’s Arizona. So what’s behind the change?